Aquamarine is the birthstone for March, this gemstone is simply stunning and is really popular in modern jewellery designs due to its pretty aqua blue colour. Named from the latin for seawater, it was thought to protect sailors at sea and calm the waters. 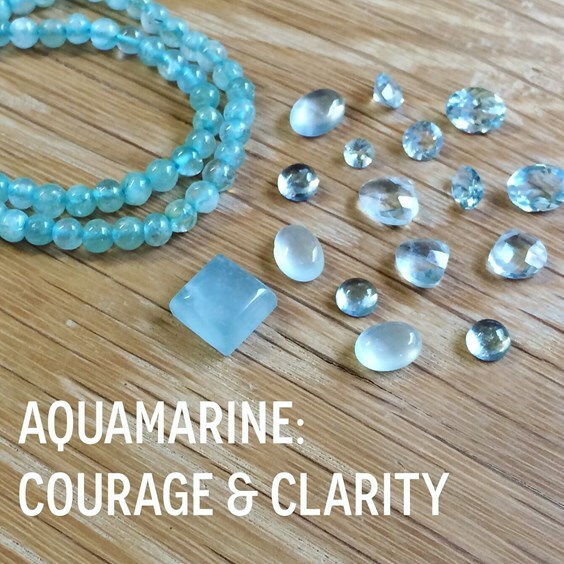 Below we will explore the history, uses and spiritual properties of Aquamarine as well as share some jewellery making inspiration. Aquarmarine is also the gem for the 19th wedding anniversary and thought to bring happiness and reawaken love in long married couples. Click here to shop our full range of aquarmarine gems and beads. Colour: Aquamarine comes in many hues of blue ranging from a soft pale sky blue to a vivid turquoise like the deep oceans. Aquamarine is a type of Beryl (Emerald is the deep green variety of the mineral). Appearance: More frequently Aquamarine is transparent, however it can also be opaque. It grows in a hexagonal crystal formation, typical inclusions are fine hollow rods which sometimes reflect white light. When growth lines are present in larger numbers a cat's eye effect or even a six rayed star is possible. Rarity: Aquamarine is a well sourced gemstone, however certain colours and desired inclusions are rare. Madagascan Aquamarine tends to be of a deeper blue shade which is one of the most sought after colours of the gem at the present time. Cats Eye Aquamarine is also very popular which is usually cut in to cabochon stones to maximise the optical effect over the surface of the stone. Mohs Scale Hardness: Aquamarine measures 7.5 on the Mohs scale so is one of the harder grades of gemstone. Sourced: Aquamarine is most commonly found in Brazil. However they can also be found in Mexico, United States, Brazil, Russia, Afghanistan, India, Nigeria and Madagascar. The popularity of colours in this beautiful stone has changed over the past few centuries, in the 19th Century the most sought after shade was the sea green / blue, where as in more recent times the Sky blue and Dark blue have become more popular. It's green / blue colouring is given by the amount of iron content the gem contains. With most of the Aquamarine that is available a heat treatment has been applied to enhance its blue hues. However, the blue hues can also be lost by overheating the stones - *we recommend* that it is always best to set your gemstone last so that it does not come under any unnecessary heat. The untreated stones tend to have a more greenish tinge to them. Aquamarine being the colour of water has been named 'The Sailors Lucky Stone' due to its link to the life giving force or nature. In Latin tradition it has also been named 'Water of The Sea' because of it's seat water colour. Old traditions say that by wearing Aquamarine you will enjoy a happy marriage and it is said to bring the woman who wears it joy and wealth. Aquamarine in legend is believed to contain the power of the sea and has been dedicated to a number of sea godesses such as Aphrodite. Sailors have used the gemstone throughout history to protect them from storms and drowning as well as to insure a safe arrival back home after a voyage. The gemstone is said to be the stone of courage. This gemstone is said to re-establish a loving communication between couples that have grown apart, attract overseas business or connections and can help to overcome fears and phobias, especially those regarding water, such as swimming and travelling. It is said to induce calming energies that reduce stress and quiet in the mind, invoke tolerance of others and help to filter information to the brain to encourage clarity. It can help with travel sickness especially sea-sickness, sore throats, tooth and gum problems and water retention. Aquamarine is also said to help with digestive disorders, kidney problems, colds and respiratory difficulties. It is thought that it can also ease panic and pain. The powers of this stone are said to be emphasised when in water however wearing the stone can still be very beneficial. Aquamarine is also a stone connected with travel, it can aid in the safety of your travels or open opportunities to widen your travels both physically and mentally. Recharge the powers of Aquamarine by placing it on a blue glass bowl filled with sea water (or water with a pinch of salt) on a full moon and leave it overnight then rinse with fresh water in the morning. Aquamarine is really growing in popularity with the recent trends in semi-precious gemstone jewellery. We predict that it's popularity will increase even with the new Spring 2016 Panatone colours that have been predicited - one of them being 'Serenity Blue', which Aquamarine reflects perfectly. Aquamarine is a strong stone so is good to work with in jewellery making, however its colour is heat sensitive so care needs to be taken when soldering (as we have said previously - always set last). Being based in Cornwall and working 5 minutes from the coast means we cant help but have a strong connection with the sea here at Kernowcraft, which is why Aquamarine really is one of our favourite gemstones. This gemstone looks especially great with silver, as well as other pastel coloured gemstones. Gemstones, Second Edition - Cally Oldershaw, Cristine Woodward and Roger Harding.